Carbon is emitted into the atmosphere (as carbon dioxide, also called CO2) whenever we burn any fuel, anywhere. The largest sources are cars and lorries, and non-nuclear power stations - those that burn coal, oil or gas, otherwise known as fossil fuels. To prevent the carbon dioxide building up in the atmosphere (and possibly causing global warming), we can catch the CO2, and store it. As we would need to store many millions of tons of CO2, we cannot just build containers, but must use natural storage facilities. Some of the best natural containers are old oil and gas fields, such as those in the North Sea. 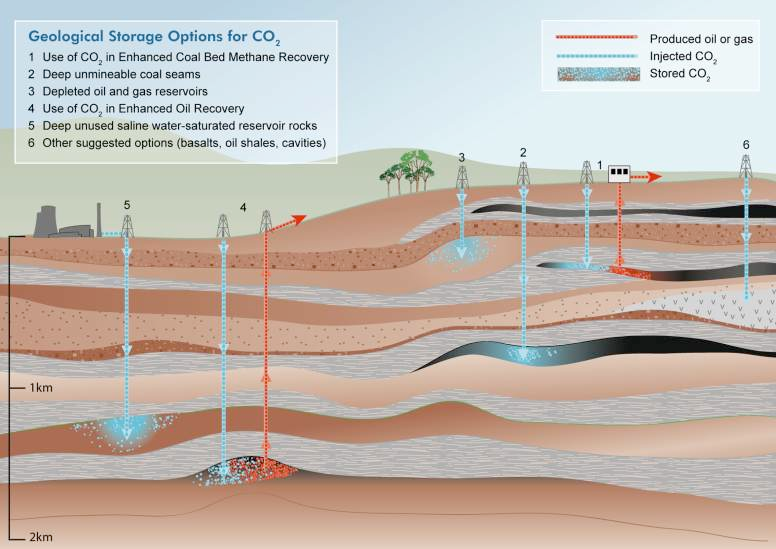 Diagram of possible locations for underground storage of CO2, from IPCC report. What might carbon capture and storage look like? Natural gas is methane CH4. This is produced from several fields, offshore in the UK North Sea. The gas is brought onshore by pipeline, to the St Fergus gas terminal, and then to the Peterhead power station, where it is burned to make electricity. At present the CO2 from burning this gas goes into the atmosphere. The plan is to add a new part onto the power station, which will use existing oil-refinery technology to split gas into Hydrogen H2 and CO2. The CO2 will be separated by a newly-designed membrane, and will then be then sent offshore, using an existing corrosion-resistant pipeline. This CO2 goes to the Miller oilfield, which is near to the end of its normal life of oil production. But, like many fields, more than 30% of the oil is still un-produced. The CO2 makes the remaining oil easier to produce - partly paying for the operation. The CO2 is stored in the oilfield, 4km below sea level, instead of being vented into the atmosphere from the power station. This is the first such integrated whole-system in the world, and could be operating before 2009. Diagram shows conceptual plan for converting methane gas into hydrogen and CO2, then pumping the separated CO2 offshore to assist with efficient oil production from the Miller oilfield. See British Petroleum website. What are carbon dioxide (CO2) emissions from the UK and worldwide? The UK emits more than 500 millions of tonnes of carbon dioxide every year. 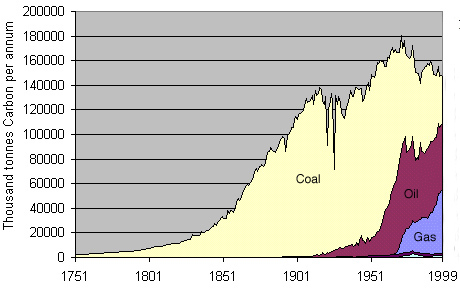 The quantity has steadily increased since the start of the industrial revolution (1800's) and peaked late in the last century. We are not the country that uses the most CO2 per member of the population - but our usage is still high. 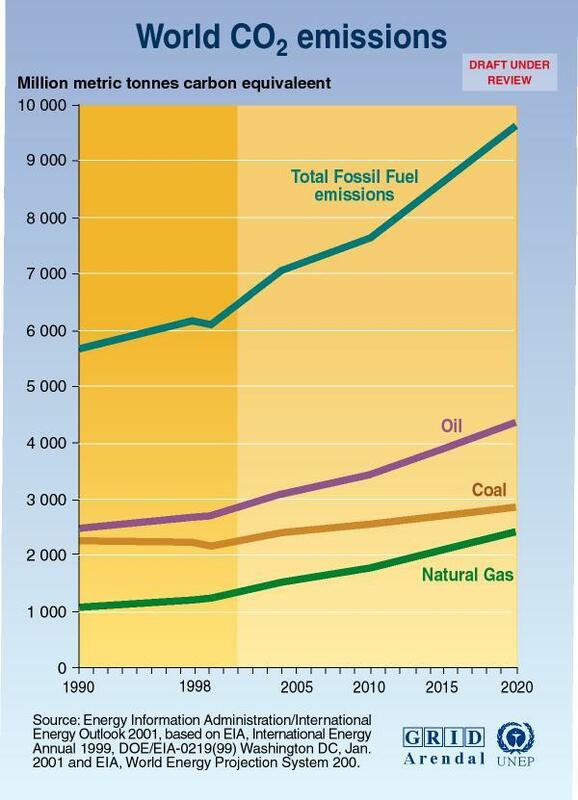 Worldwide, emissions are still rising. The National Energy Foundation has a good explanation of why some countries emit more CO2 than others. How does CO2 affect the climate? The effects of carbon dioxide in the atmosphere are controversial. However, the average temperature of the Earth is rising, especially when measured at the poles. Note that the average Earth surface temperature correlates well with the amount of CO2 in the atmosphere (i.e. as the CO2levels in the atmosphere have increased, the surface temperature has gone up at the same time). In the diagram, the average temperature is in red and the CO2 content of the atmosphere is in green. 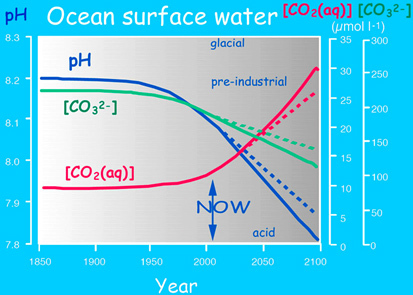 How does CO2 affect the oceans? The acidity is shown as a change in pH units. The effects of this change on marine life is unknown, but could be disastrous. Why is the UK a good place to capture and store CO2? 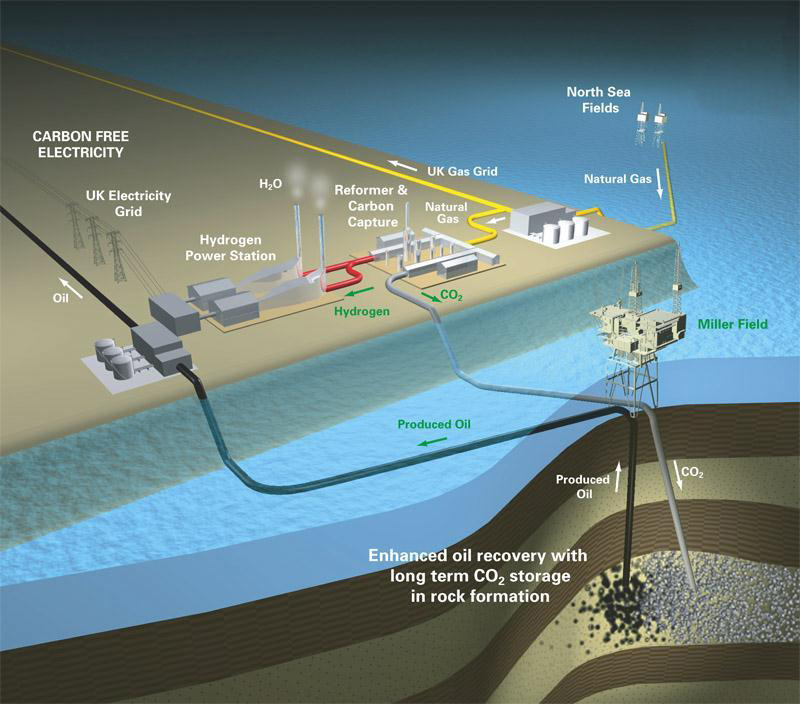 The UK has numerous oil and gas fields, many of which are becoming emptied of hydrocarbons. These are perhaps the best places to store CO2. A study in 1996 estimated that we have space for about 5.3 Gt CO2 in depleted oilfields, and about 11-15 Gt CO2 in depleted gas fields. This is about 5, 300, 000, 000 tonnes of CO2 in disused oil fields - about 10 years of total UK CO2 emissions in oilfields, and a further 30 years in gas fields. We have the technical expertise to plan the storage (gained from extracting the oil and gas), and an established industry base that could undertake the work. There is a second type of geological store, known as saline aquifers. These are porous rocks deep below ground that are full of salty water that is of no use for drinking or agriculture. In the UK, the same 1996 study estimated that we could store 19 - 716 Gt CO2 like this 716, 000, 000, 000 tonnes of CO2 - perhaps sufficient for 500 years of UK emissions. There are more geological problems in using such storage sites, as we know less about the geology. However, many of the rocks are similar to oilfields, so there is good reason to suppose that these saline aquifers are well worth investigating in more detail. Infact, the only present day test site for underground CO2 storage in the North Sea uses a saline aquifer at 1km below the seabed, which is sited above the Norwegian Sleipner Field. Now! We should start CO2 injection immediately, and expect to have to continue until at least 2030. Hopefully by this time we will have developed lower-carbon technology and have reduced CO2 emissions to levels that are not causing environmental damage. There is a good reason why we should start CO2 storage sooner rather than later - at the present almost all of the UK offshore oil and gas fields still have their platforms in place - these are the 'oil rigs' that everybody is familiar with from photos in newspapers. These platforms can be modified for CO2 storage, at a fraction of the cost of building and installing new facilities. By the end of the next decade, many of these platforms will have been removed as the oil and gas supplies run dry. This would leave only a fraction of the storage potential for CO2 that we have at present. The longer we wait, the worse it gets. You may not believe in climate change, but most scientists believe that the evidence of high CO2 levels and hot climates in the past is compelling. 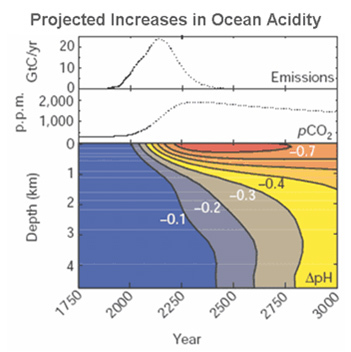 You may not care if the summers get a few degrees warmer, but the ocean will inevitably become more acid, and the last time that happened it became a layered green soup (about 50 Million years ago). Click here for more information on predicting climate change in the future. Like all preventive medicine, it's easier to put off the fateful day. But when that day arrives, it causes you more pain, and costs more, compared to early actions. 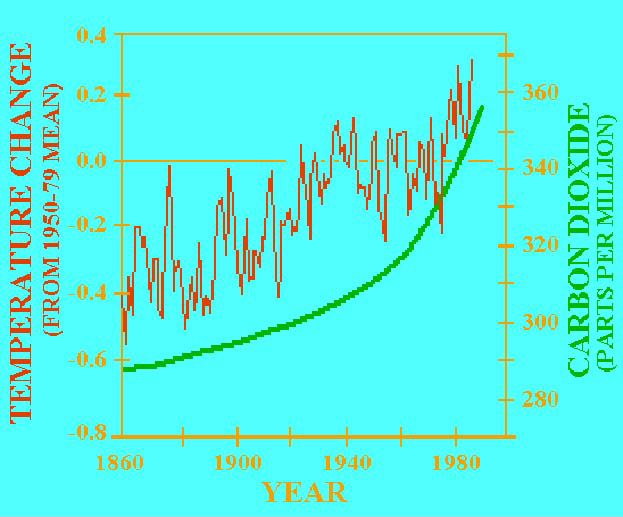 Its important to realise that, even if we act now, in 2005, the climate will carry on warming for another 3 or 5 degrees Centigrade. That means some parts of the UK may have a climate like southwest France. But where will the Spanish live, and the French, and all the people in North Africa, and all the people in the southern USA, as these areas dry and heat up to become uninhabitable desert? By acting now, we have a chance to limit that rise to less than 5 Centigrade, by keeping atmospheric CO2 less than 550 parts per million. This will cost money, in more expensive fuel costs. However, it will not cost very much. For the world scale, estimates are commonly about 2% of Global Domestic Product. That is one year of normal growth. Each individual in the UK is responsible for about 10 tons of CO2 each year, and estimates of cost for capture, liquefaction and storage in North Sea aquifers are about 20 pounds per ton. So that costs about 200 pounds per person each year. If energy efficiency is also increased, the cost may be only half of this - 100 pounds per person per year. That’s about 1p or 2p on each electricity unit. Will that be a disaster? Well in the winter of 2004 -05, gas prices increased far more than that, and in the year 2004, the price of crude oil and petrol increased by far more than that. And nothing catastrophic happened to the UK economy. How much is it worth to keep the world habitable, and the oceans alive? The component parts of Carbon Capture and Storage are all present. However, the money does not work out yet, because a Generating company needs to pay for capturing the CO2 and transporting CO2 towards a disposal site. Then an Oil company needs to pay to place the CO2 deep below ground. The UK Chancellor of the Exchequer stated on the day before the Budget that: "I can, therefore, announce today that as part of the UK Government's continuing support for research and development in this field we will now examine the potential of economic incentives to encourage carbon capture and storage." And in the text of the 2005 Budget that "Carbon capture and storage (CCS) is a process by which the carbon in fossil fuels is captured as carbon dioxide and committed to long-term storage in geological formations. It has the potential to significantly reduce carbon emissions from fossil fuel power generation. It is likely to prove a critical technology in global carbon reduction strategies, particularly for countries with fast-growing economies and rapidly growing fossil fuel consumption. The Government is, therefore, examining how it might support the development of CCS in the Climate Change Programme Review, including the potential for new economic incentives." The DTI has a 2005 Carbon Abatement Strategy. and DEFRA has a Review of the Climate Change Programme - to be published in late summer 2005. Another way to decrease the amount of carbon dioxide in the atmosphere is by switching to renewable energy. There are many options out there these days that can reduce your carbon footprint, such as solar power, wind power and air source heat pumps.